The boatyard AB Yachts, belonging to the Fipa Group, is currently building a new 88' motor yacht. This is boat designed over two decks, characterised by its luxurious interiors with their refined details and custom solutions to be chosen by the client. 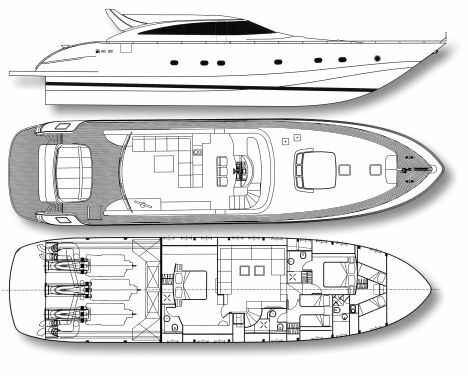 To limit displacement to a minimum, the hull, upper works and interiors are in composite. Thanks to this solution there are fewer masses in movement, all contributing towards comfort underway and performance. The particularly well thought out interiors of AB 88's also add to the pleasure of sailing. Wood is used more than any other material, for all the furniture, ceilings and floor in the salon, while the rest of the detail is entrusted to the wood plank ceilings covered in "Ultraleather Ivory" fabric, sofas and chairs in leather, taps and accessories of a high standard such as the door handles and chrome halogen recessed spotlights used throughout the rooms. The sleeping area occupies the lower deck where we find the full beam owner's suite in the main area of the hull. This has a central double bed, access to the dressing room to port, entrance to the en suite bathroom to starboard, a small relaxation area and office corner. For the owner's leisure time a system including flat LCD screen, DVD player and radio/CD is standard. Forwards of this you enter the large salon furnished with roomy C-shaped sofa to port, opposite which there is the stairway leading to the main deck. Towards the bows after the dinette there are the two guest cabins, one being a VIP suite and one with twin beds, both with private bathroom. In the far bows there are the crew's quarters with two bunks, bathroom and small cooking area. The main deck offers a spacious area inside the deckhouse, equipped with sliding ceiling hatch, where we find a saloon with generous L-shaped sofa and multimedia system with LCD TV that can be hidden away when not in use. The bow area of the upper works houses the command bridge, occupying the full width of the boat at this point, completed by three ergonomic armchairs. Outside the deck and walkways are all in 8mm teak and there is a good-sized cockpit with roomy sundeck, to the sides of which there are two elegant stairways leading to the main deck with its stern platform. The latter gives easy access to the tender garage via the hatch in the transom. In the bow area of the deckhouse there is another zone fitted out with large cushions for sun worshippers. Standard engines are a couple of 2,000 HP MTU16V2000, permitting an official maximum speed of around 42 knots. For even better performances the AB 88 can be fitted with three 2,000 HP MTU engines, coupled with the classic Hamilton water jet transmission used on all the AB range of Yachts. For further information: AB Yachts; via Dorsale 13; 54100 Massa; Italia; +39 0585 253497; fax +39 0585 251690; website www.abyachts.com; e mail info@abyachts.com.